Wondering who We are? We are a one stop shop; womb to tomb care! The Ruben Centre organised a music Ochestra during the August 2018 Holiday for primary and secondary school students who were interested in learning music instruments. This was made possible through partnership with Gheto Classics. Within a short period, the students are now gurus in playing different music instruments. Watch out for the upcoming Music Camp this April Holidays which will look into empowering the children musically and to grow their confidence to speak and sing to the world. Five of our music students have also been given a golden opportunity to travel to Poland in June to showcase their prowess in playing music instrument as well as engage in other Art and performing skills. Our vision for this orchestra is for it to be a true instrument for uniting the whole slum community, including the children, youth and adults alike. Primary children when they progress to high school are welcome back every Saturday and holiday period to continue their music education. Eventually these older young adults will become the teachers and mentors for the younger ones. Ruben Centre is a non-profit, faith-based organization striving for an empowered and just Mukuru community by providing quality education, health, financial and social services to children and families in the area. Run by the Christian Brothers African Province, it is one of eight Christian Brothers project sites across Africa, and offers a vital source of community development programmes to the residents of one of the largest slums in Nairobi. Ruben Centre runs 27 different development programs, spread across 5 primary categories. The Ruben Centre Health Clinic began in a tin shed in 1992 and was first started by a Japanese NGO – African Education Fund. After the Christian Brothers began administering the Centre, a new clinic was built and it opened in 2003. This new clinic offered much needed improvements and to date the clinic offers a range of services to residents of Mukuru Slums and beyond. Ruben Centre’s strategic Objective one is To Improve Access to and provide Quality Primary, Secondary and Vocational Education to children in the slums of Mukuru. A.E.F Ruben Primary is a public sponsored school by the Christian Brothers - Australia.The school has a population of over 3,000 children with 58 teachers ;28 government teachers and 30 project teachers. Aims to provide livelihood opportunities to extremely vulnerable women and Youth in Mukuru Slums. It uses theoretical and hands-on skills training in different handcrafts to ensure professional, innovative, holistic and technical input that enhances their work opportunities and gives greater awareness around business development and management. With a focus in strengthened human, institutional ad infrastructure of Ruben Centre to effectively continue to respond to the needs of Mukuru Community by: Sustaining Capacity building opportunities including recruitment and retention of staff in all departments and sections including proper succession procedures to avoid any gaps left by staff who leave the organisation. As the only Community Centre, and “one stop shop” in Kwa Ruben our diversity of projects enables choice and change for people who are caught in the "poverty penalty”, and, whose vulnerability is more pronounced because of the lack of government/donor funded investment in this particular slum. In fact, over the past two years, the slums of Mukuru have been highlighted in a number of international studies, and these indicated the negative impacts experienced by this community, because of the minimal attention or support received from the Kenya National and County Governments. A.E.F Ruben Primary School has continued to offer free-quality primary education to children in the Mukuru Slums and beyond. The school is a public-sponsored. Thousands of students have completed their Kenya Certificate of Primary Education at Ruben Centre. The school has 58 teachers: 30 project teachers paid by Christian Brothers and 28 government teachers. 50 children with disability are also accessing free education through the Ruben Centre Special Unit. Ruben Centre was started in 1986 by a Mercy Sister, Sr. Mary Killeen who saw the need to start a primary school for children in the slums who did not have access to education. She Handed over the Centre to a Japaneese organisation ;African Education Fund (AEF) who started the first clinic in 1993. The Japanese handed over the organisation to Christian Brothers- Australia in 2000 and they are currently offering 29 programs tailored to empower the Mukuru community. Our first class birthing unit is offering dignified, free, 24/7 maternity services to women in Mukuru who would rather have delivered at home by help of unqualified mid-wife while others would end up in illegal pharmacies operated by quacks offering illegal delivery services. We also have a stand-by ambulance to respond to emergencies that may occur during delivery. We have had over 60 cases Referred for specialized care in advanced facilities. Some of the new beds added in our new maternity wing. Beyond-zero. It probably may not make sense on its own. So I will try explaining it as I witnessed at the maternity clinic at Ruben Centre. Under the umbrella initiative covered by beyond-zero, “Linda mama” is catering for the free delivery of babies. Basically what happens is that upon arrival at the Ruben Medical Clinic, a mother is registered for Linda Mama (if she’s not a member). In a world of technological advancements, rapid population growth and instant developments, space is becoming a limited factor. In the year 2010 a research showed that over 3.5 million kilometers of the earth is occupied by urban development. Over the years this number has definitely increased to an estimate of over 4 million kilometers. It somehow described my celebration of yesterday’s Church feast of the Annunciation.I tried to engage the theology of it all until I drifted into a zombie like state and after an hour of meditation, I had had the event but definitely not the experience. Today I woke up much more alive and in my morning ritual I suddenly was truly conscious; wallowing in meaning and revelation. The experience of yesterday suddenly became flesh and in my body and soul and I own this mystery that is near. Yes yesterday was made known to me and I heard, Rejoice highly favoured, own and celebrate what the women of those special needs children were telling you. Those mothers of the special Needs Children were having their monthly support meeting and sharing openly with the Centre counselor Sr. Eliza. You can become part of the Ruben Centre by getting involved with us in various ways. Ruben Centre welcomes people to join us by volunteering, donating to support our programs, signing up to become a Ruben Centre Champion or by visiting us to have a first hand experience of the work happening at Ruben Centre. 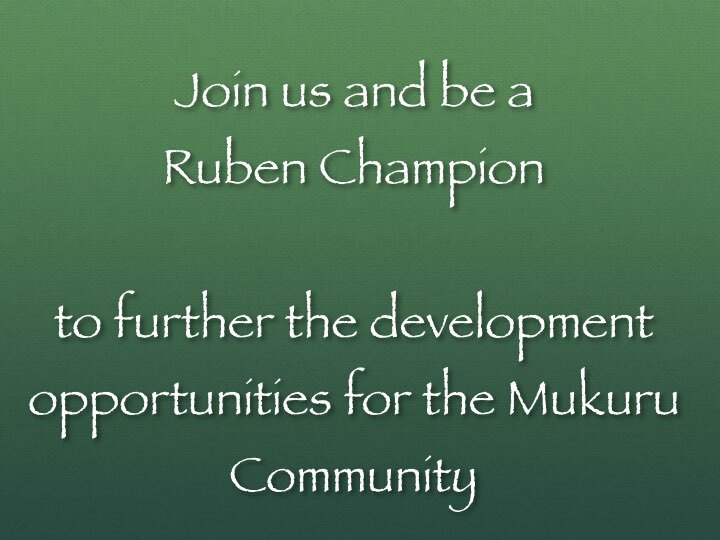 We need champions (people, organisations, governments) who will work with us to create future opportunities and further the development opportunities for the Mukuru Community. You can do this by fundraising for our programs, linkages with possible donors and create awareness about our work to friends and social networks. Are you a game changer? Are you looking for a place to volunteer your expertise in a Community Based Organisation in the heart of Mukuru Slums? Ruben Centre is looking for professional volunteers in areas of health, education, community development and areas of Organisational capacity to join us. You will get a fulfilling experience. Our Programs are donor funded with our major donor being Edmund Rice Foundation Australia. We welcome individuals and organisations to donate towards Ruben Centre’s Different Programs. Your donation goes a long way to put a smile on the faces of the less privileged and the vulnerable people living in the slums of Mukuru.